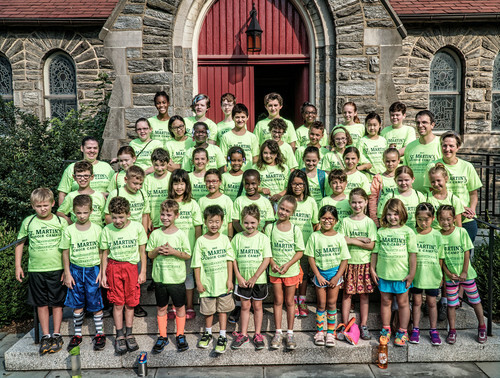 Join St. Martin's for a week of music, fun, games, and worship as children learn the basics of choral singing and leading worship! Our program is open to rising 2nd graders through rising 8th graders. Choir Camp 2019 runs Monday, August 19 - Friday, August 23, from 9am - 2:30 p.m. Early arrival is at 8:30 a.m. After-care is available Mon-Thurs until 3:30 p.m. There is a trip on Friday so all pick up is at 3:30 p.m. that day. Church membership is not required; we welcome children of any faith / religious background. Daily sung services are from a Christian perspective. Daily schedule includes rehearsals, games, lunch, a short concert by a local musician, and an Evensong at 2 p.m. Evensong is a short service of music and prayer. Parents, guardians, families, and friends are all invited to join us at 2 p.m. for Evensong in the church. Evensong is led by the campers. On Friday, August 23, we hope to travel off campus to sing at a special location, to be determined, followed by a visit to nearby attraction. Campers will be riding on a bus for this event. Parent volunteers will be needed for this event. All camp registration includes lunch daily, a t-shirt, and Friday trip costs / museum entry. After-care for Mon-Thurs is an additional $10 for the week. Choir Camp is $75 per camper for the week and runs from 8:30 a.m. to 2:30 p.m.
*After-care is $10 per camper for the week and runs until 3:30 p.m.* After-care is not necessary on Friday, as there is a field trip and all campers will be picked up at 3:30 p.m. on that day. If you need financial assistance, please contact Erik Meyer at emeyer@stmartinec.org or 215.247.7466 x104. To pay now, please use the payment button on the first page of the Choir Camp event registration. Scroll to find the number of children and after care options that match your registration.